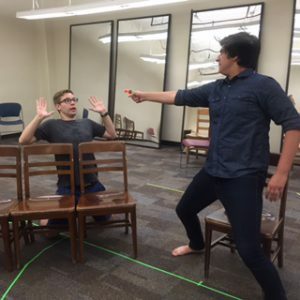 At rehearsal of A Flea in Her Ear last night, I witnessed the physicality of farce at its best and couldn’t help but laugh out loud when Histangua kicks Chandler into a closet threatening him with a gun and again when Laura aggressively backs Tournel onto a desk. I went home with a smile on my face. Why do we love plays like Wilde’s The Importance of Being Earnest, Shakespeare’s Taming of the Shrew, or the most famous farce, Moliere’s Tartuffe? Why do we watch reruns of Seinfeld or I Love Lucy, and can someone please tell me how a movie like The Hangover becomes a franchise with multiple sequels? The answer lies in the function of farce in our culture. During Medieval Times, farcical plays were used as a way to bring laughter into a world of religious oppression and impending death from the plague. Farce helped people deal with what felt like an overwhelming life situation. Using physical humor, absurdity, characters in altered states of mind, satire, and exaggeration, farce, as a genre, helps the audience look at serious issues through laughter. It is a release valve of sorts. The humor of a farce provides comic relief for a culture’s most serious tensions. For example, laughing at Lucy trying to get into show business or make money relieved the tension society was feeling about women reentering the workforce and the feminist movement in general. 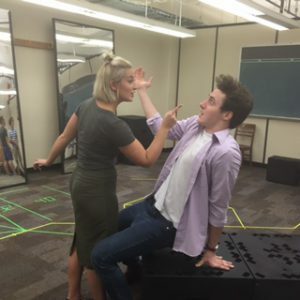 A Flea in Her Ear is a typical farce using all its genre elements to help the audience laugh through the things that we are feeling tension about today. The physicality and bawdiness of the humor paired with the sometimes serious subjects being lampooned make farce a particularly difficult genre to stage. “A Flea in Her Ear” is a lot of fun, a release from cultural tension, and you do not want to miss this show.